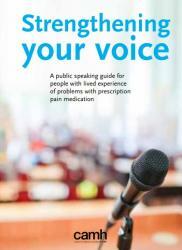 A guide to speaking publicly for persons with lived experience or family members supporting loved ones dealing with opioid misuse. This resource was developed by the CAMH Opioid Resource Hub, part of EENet, located in the Provincial System Support Program at CAMH. Health Quality Ontario (HQO) and the Canadian Research Initiative in Substance Misuse (CRISM) recently released new guidelines for the treatment of opioid use disorder. On April 24th, the Opioid Resource Hub (PSSP/EENet) hosted a webinar on Community Overdose Response Planning. A new infographic on the outcomes of Supervised Consumption Sites.